Film has an immediate power that few other arts possess. It can evoke emotion and outcry from the first scene to the closing credits. This power can be harnessed for enlightenment or propaganda, entertainment, and can be perceived as something beautiful or ugly. And there comes a point where it transcends art and becomes a message. Let me elaborate. One of the films screened at Pillows and Popcorn was “City of God.” And it caused great distress with some of my colleagues who attended. If you’re not familiar Pillows and Popcorn is a fun film screening in the Paseo we had last July. It aims to highlight independent film making. I think the reasons for audience distress is varied and I want to explore some of them. I want to illustrate how film instantly transforms from something of interpretation into something to be judged, celebrated, or portends a warning. For those of you who are not familiar with the “City of God,” it is about a group of young hooligans who end up taking separate paths in life. The film has been called the “Brazilian Good Fellas” by the critics who lauded it for its storytelling. The narrative is about three characters, Lil Zeke, who from an early age displays a propensity for ultra violence, Rocket, who finds a possible way out of an impoverished environment via artistic expression and his camera, and Ned, who inadvertently becomes a hero but ultimately turns into a villian. There are faceted glimmers of humanity in the film, but as to be expected in stories such as these, there are also scenes of shocking brutality. So where was this sudden shock coming from? How was it insensitive to particular audience members? I have an idea and I see at it as positive. The person of African American heritage who was hurt by my choice of film is a strong woman who really should be nominated for her work in striving to promote positive vision of Black culture. There isn’t a better or more deserving human being. But the comment that the film was shameful was something that puzzled me. For the first time in years there is a shift in which Black culture uses the word “Shame” for those values that ultimately detract from the culture. Prior to this there was a near fanatic celebration of all things black and even a justification of negative celebrity stereotypes. Look, I grew up during the era of the film “Colors.” It actually helped to usher in gang violence in Oklahoma, and in the rest of the nation for that matter. Within a few months of it’s release, I lost several friends. We suddenly went from breakdancing to…other things. 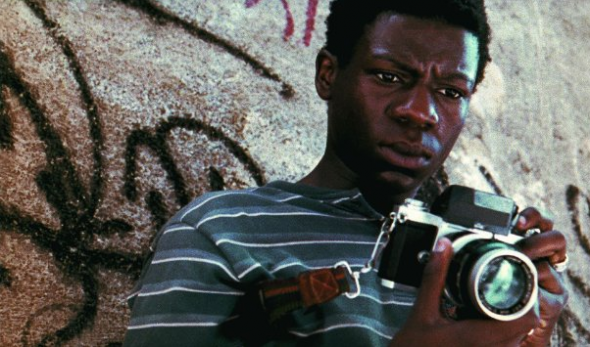 “City of God” showed a lack of regard for life and desensitized human beings that were caught in a cycle of violence. Anyone familiar with that time can see the obvious social parallels. Still Oklahoma is seeing an African American community that is ashamed of the senseless violence and it no longer is embraced as a part of the culture. My friend has seen more than me. She has seen discrimination from a a vantage point that I never have. She is heroic in that she didn’t stop. She and other Blacks fought and stood with pride and at the time, they had no idea of the bigger picture they were laying the foundation for. I salute her. I also question her views on “City of God,” but it is not to minimize her reaction. I mentioned to her that “City of God” was happening in the heart of northeast Oklahoma City. Always has been. It is a shame for us, and I think this kind of violence was polarized when brought before others from a different culture. I think the shame was magnified by the recognition of certain contributing social factors. It should be. But it was wrong long before others that are African American saw the film, all the film does is tell the story of how these people come to form the negative social connections and participate in violence. My other colleague who watched the film was white and was just as devastated. Even though the “Black experience” was not hers, she was gripped by the starkness of the violence. For her it was not black on black, it was death needlessly stalking and murdering life. She related to the humanity of the film because, unbeknownst to me, she had seen much violence in her life time. The perspective of both these individuals were the same. The violence of “City of God” was overt and affecting. The points of view of the these two people were related. When you take away the words “black” and “white” you are left with the human emotion of loss that the film conveyed. Today we pick and choose the violence we bury and the violence we continue to give life to. The Tulsa Race Riots were a shameful time in history. There are films about it and every year we as blacks discuss it in front of our white counterparts. It’s how we reconcile the past. For many whites, they hate the reminder that their history is connected to an atrocity, but as an African American I feel like it has to be addressed if we are to move forward. To put it in perspective, yes. Tulsa’s race riot was whites against blacks. But “City of God” showed us the stupidity found in all kinds of violence. It was the intercultural violence that was remembered by my black colleague. “Black on Black” violence, “White on White” violence, “Black on White” violence, it’s all the same. If we can get to a point where we can strip away biased accusations and prefixes before the word “violence,” maybe we can begin to talk about things in their purest form. And where the power of film comes in, is that it lets us start to translate the message and think about it away that is immediate and effecting. Tagged African American, African Americans, ART ✍, Brazilian Good Fellas, Editor Note, film, IMDB, in COLOR Film Festival, Inclusion in Art, Lil Zeke, OKC, seen. Bookmark the permalink.